Click "Add to Cart" button to purchase online now. Top left is NE. Image width is about 12 arc min - Image and text © Anglo-Australian Observatory, Photograph by David Malin. The disc of NGC 2997 is inclined at about 45 degrees to our line of sight, revealing its internal structure and giving the galaxy an oval appearance. Seen face-on, NGC 2997 would look rather like Messier 83. 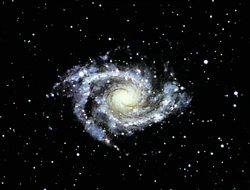 Like most spirals, the galaxy has two prominent spiral arms, which appear to originate in the yellow nucleus, are peppered with bright red blobs of ionised hydrogen which are similar to regions of star formation in our own Milky Way. Within these gas clouds are produced the hot blue stars which generate most of the light in the arms of the galaxy. A much older population of yellowish stars are concentrated around the nucleus.